Ken Wright, the head football coach at IMG Academy in Bradenton Florida, a pipeline for several of the major college football programs, opened a video on his computer screen on the recommendation of a friend and chuckled. The footage showed fourth grade boys lined up in a spread formation–quarterback lined up in the shotgun and the wide receivers dispersed across the field. As Kevin Wright put it regarding this story from the Washington Post, this was “an odd place to find the roots of the NFL’s watchability problem.” There is a reason that, while NFL ratings have been declining the last few years, college football ratings have continued to rise: college football is simply better entertainment. Sure, NFL players are far superior talent-wise to college players, but as I tell a friend all the time, superior talent shouldn’t be confused with superior entertainment. As the author of the above referenced article suggests, it is the NFL that is out of step with the rest of the football players in this country, the reason why offenses simply are tighter and more congealed at the college level, and why the grumblings of NFL coaches frustrated with the lack of quarterback development at the college level are misplaced. But while this is at the heart of why I argue that college football is a better product, this only scratches the surface. While I have seen others opine on this very topic, I haven’t seen as exhaustive a list of the reasons why college football is better than the one that appears below. 1. Chicks dig the long ball. 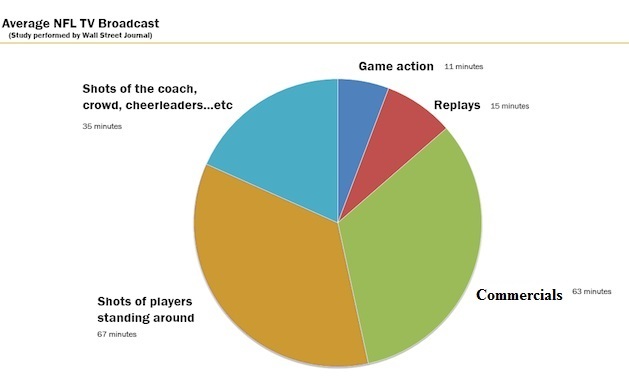 What do fans really want to see in a football game? Screen passes and two yard runs up the middle? Ahem, no. Fans want big plays, and college football simply delivers more of them. This sobering piece breaks down the “action” of a NFL game. The typical NFL game will feature 133.6 “regular” plays with fewer than 7% going for more than 20 yards. 11% of plays will be for no gain or a loss in yardage while only 22.8% of total plays will be for 10 yards or more. On average, you can expect 3.1 passing touchdowns and 1.6 rushing touchdowns in a full NFL game. The average NFL game will be a score of 29.0 to 17.8. All in all, not a lot of long ball here for the chicks. Compare this to a college football game, and well, there is no comparison. Here, and by way of contrast, in 2018-19 in college football, 54 FBS teams are averaging 29.2 points per game or more. And take a look at this graph, which details the average yards per play in college football; there is a whopping 94 FBS Division 1 teams averaging 5 yards per play or more!!! You read that correct, for more than two-thirds of the teams in the big boy bracket of college football, they are statistically picking up a first down regularly without ever having to snap the ball on third down, culminating in more big plays, longer drives, and more total points being scored. In 2016, teams had eclipsed the 30.4 points per game mark for the first time, up 4 points per team from 2000. This equates to 2 more touchdowns each game than your typical NFL game. And trust me, NFL executives are aware of this, which is why their rules committee has made it nearly impossible for defensive backs to play defense in the NFL. It also why the NFL generates fake offense in the form of spot fouls for borderline pass interference plays,, or why, it could be 3rd down and 33, and a team will get an automatic first down from a ticky-tack five yard defensive holding call. Here is the thing–while the NFL desperately tries to make its game look more like the college game, fans don’t tune in to wach septtuagenarians walk off fake penalties to generate faux offense–fans want the players to make big plays, and college football delivers this more often. 2 .You get to watch more games stupid. It is simple math, with 132 division one FBS teams playing most weeks compared to 32 NFL teams, there are more college football games to watch each week. But raw numbers tell only part of the story–with more fans preferring to stay home and watch games on ever more impressive flat screen televisions, it is access to the games that really matters. After the initial investment of a television to be able to view games, fans of both will need to purchase some extended television package (whether that is cable, satelite, or some streaming service). But this is where CFB really separates itself from big brother, as the NFL still holds back most of its content for its exclusive NFL Sunday ticket, at whatever fee they are able to extort from their customers. Here is one typical CFB Saturday, where fans can see more that 50 college football games with a standard package. This means that, years ago when Clemson blew out Louisville in what was supposed to be a marquee matchup, viewers could just switch the channel and watch Mississippi State’s startling upset of LSU or the Texas-U.S.C. overtime thriller. Compare this to the NFL, which typically gives you one game on Monday, one on Thursday, 3 during the day on Sunday (heaven forbid you show a game opposite the home team, as if that is the only game one would care about), and one on Sunday night, with the rest reserved for the their golden ticket that at times commanded $350 for the season. That means if your game of the week is a blowout, you are stuck with it. The NFL is so greedy, that bonus coverage of games on regular networks can only be partially shown because the NFL is so afraid this will impact sales for its ticket package. Simply put, one gets to see more college football every week at a lower cost. 3. And those games are longer and that’s also a good thing stupid. It isn’t just the total number of games where CFB delivers more to the consumer, but longer games that feature more plays. As I referenced above, the typical NFL game features 133.6 plays per game. But in college, it is not unusual for a team to run 90 plays or more per game; again, more football. Using Teamrankins.com, 81 FBS teams ran 70 plays or more each game. But it isn’t just the total number of plays that are run each game where CFB has the NFL beat. One of the primary reasons there are more plays run in CFB is because more teams are going to hurry-up-no-huddle offenses, meaning there is far less downtime between plays and more action for the consumer. Have you ever stopped to wonder how many minutes of actual action you see in a NFL game? For the 2015 Superbowl, while the adds ran for 1 hour and 29 seconds during the game, actual plays only comprised 12 minutes and 6 seconds (making it even more absurd, the half-time show ran for 12 minutes and 41 seconds). Though the total number of minutes in a typical CFB game is only about 15 minutes according to a Google search, that is more significant than it sounds when one considers the average time for each play is approximately 5 seconds. I hear some complain about the length of college football games and I have to admit, I don’t get it. What is better, more football, or less football? Here’s the thing, you want less football, shut the tv off. But if I want more football and there are no games on, I can’t watch. Not real complicated. 4. Games played by college students are just better than games played by millionaires. Let’s just get this out of the way, NFL players are much more talented then their college football counterparts. We know this by the numbers, where about 1% of college players will ever collect a paycheck to play professionally. But better players doesn’t necessarily equate to better entertainment. A good analogy is that, while male tennis players are clearly better at the sport as evidenced by 140 m.ph. serves, many fans actually enjoy wathcing women’s tennis which has fewer aces and more sustained volleys (err, did I just compare college football to women’s tennis?) As addressed above, there are more big plays in CFB and more scoring, and I think much of that has to do with the fact the players are so good at the next level that receivers get less separation, passing windows are smaller, and quarterbacks have less time to make plays, one of the reasons so few are able to play that position well in the NFL. But I think the difference is even more basic than this–it comes down to passion. As John Bacon put in Fourth and Long: The Fight for the Soul of College Football, what army would you expect to fight harder, an all volunteer army or paid Hessians? Or for those of us in the corportate work place, who fights harder to impress the boss, the intern who badly wants a job or the 16 year employee trying to get a 3% raise? 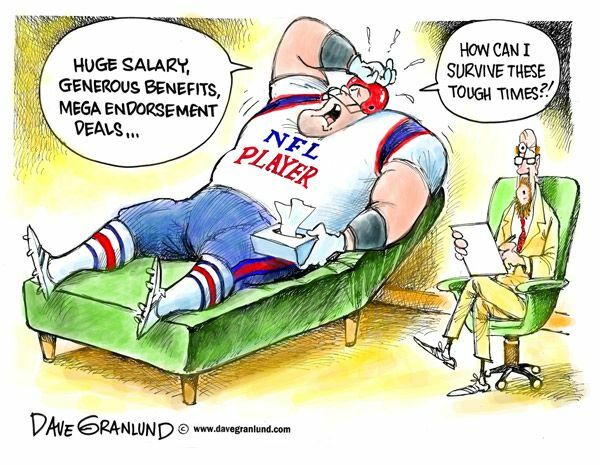 At the end of the day, NFL players are millionaires whether they win or lose. For them, it is just a job, but in college, players play both for the love of the sport and for the hope of one day getting a job, and that results in more passionate play that is simply more enjoyable to watch. 5. The college football regular season matters more often than it does in the NFL. For years, we heard the mantra in college that “every week matters,” and many have derided this slogan when convenient for their argument du jour (why hello Playoff Guy, pull up a chair). Before I explain my thoughts though, lets make sure we are comparing apples to apples. That is, we should compare a college team that has a realistic chance to play for a championship to a similarly situated NFL team (which means, don’t get fooled by 7-9 division winners in the NFL given a charitable playoff spot). The NFL season is comprised of 16 games, and it is almost a virtual certainty that a 10 win team will earn one of 12 playoff spots. This means that if your primary goal is to see if your team can win a championship, you could wait to start watching NFL games until your team loses their fifth game or so. But in college, teams can be elimated from playoff contention with just one loss, meaning each week during the regular season takes on a playoff type feel. Unfortunately, the trend in professional sports is to package more and more bloated meaninglessly regular season games so more advertising revenue can be generated, which is why the NFL periodically talks above adding even more meaningless games. But if many of the games don’t really impact a team’s championship chances, and that’s what I care about, why am I watching them? According to the data, fewer and fewer NFL fans are. 6. College football does a better job of crowning a “worthy” champion than the NFL. This one will probably draw the most objection from not just NFL fans, but from the loud underbelly of college football fans that have been clamoring for an expanded playoff in CFB for at least two decades now. But notice how I worded the header; I did not say that college football does a better job of determining the best team, but rather, crowning a worthy one. For starters, with 132 teams playing few overlapping opponents, it will be nearly impossible to realistically determine the “best” team anyway, a reality Playoff Guy refuses to acknowledge. But what CFB does do is restrict playoff entry to the smallest percentage of any sport (2.4% of FBS teams make the playoffs in CFB while 37.5% of NFL teams do so), which functions to ensure that whoever is crowned the champion will be a worthy team from a win-loss perspective. As a point of comparison, the NFL crowns the winner of a post season tournament as its champ, a scenario that has often produced laughable results. In one instance, the NFL crowned a 12-7 team its champion over an 18-1 team when the two teams split their head-to-head matchups. Such nonsense will never happen in college football. 7. Yo, how is Boise State doing? With only 4 teams making the playoffs, it matters almost as much to fans how other title contenders do. Let’s say your team sits fifth in the polls and the fourth place team is in a close game in the fourth quarter against a team they should probably be beating soundly. If you are like me, you grab the clicker and put that game on because it effects your team’s chances of playing for a title. I will never forget sitting around the t.v. with family and friends watching a Boise State-Nevada game in 2010 because a loss by the former could have increased Ohio State’s chances of making the title game. While this theoretically could happen in the NFL as teams fight for the last playoff spot late in the year, it happens far less frequently because of the number of playoff spots and because fewer games impact any one team’s chances of making the playoffs, since playoff spots are broken down by conference affiliation then by division alignment. 8. The CFB system gives us marquee regular season matchups that are true events. And this simply doesn’t happen in the NFL any more. There are several reasons for this, many documented elsewhere in this piece. First of all, there are 132 FBS teams, so every season we see matchups that have never happened or have happened infrequently. Also, the impact of a regular season loss makes these matchups more significant in the college football arena. One of my fondest CFB memories was travelling to U.S.C. to watch Ohio State play the Trojans (competitively for about six minutes as it turned out) in 2008. More than 10,000 Ohio State fans travelled to that game, which featured a pregame rally the night before and one on the U.S.C. campus on game day in what can only be described as a carnival like atmosphere. This game was hyped for more than a year, with the folks from Game Day showing up to further capture the electricity of this matchup. Again, and not to belabor the point, but this simply doesn’t happen during the regular NFL season, in part because the teams see each other more regularly, but also in part because a win or loss in any one NFL game is fairly meaningless. 9. Only college football offers the viewer a real life Rocky Balboa story. If you look at this piece I wrote in 2010, parity in the NFL has created a situation where there are a few dominate teams at the top, a few doormats on the bottom, with a beer-gut of mediocre teams clustered in the middle. We can debate whether or not this actually makes for more competitive games, as the piece referenced in point number one details that there are still a fair amount of blowouts in NFL games. But what has been lost in this parity analysis is that there are fewer and fewer true David and Goliath type matchups in the NFL, meaning that there are fewer and fewer big upsets. And if there is one thing sports fans universally love, it is watching the little guy win. Every year in CFB, teams from the lower FCS subdivision beat teams from the FBS subdivision, and some of CFB biggest moments are huge upsets that seem to shake up the college football landscape, such as 41 point underdog Stanford knocking of U.S.C. in 2007. Sure, upsets happen in the NFL, but it just isn’t the same thing when a six point dog takes down the favorite in a system where a six loss team gets a ticket to the dance. By contrast, that Stanford upset win, for all intents and purposes, ended U.S.C.’s playoff chances in 2007, and that is why fans talked about it so much. Aerial photos of the Red River Shootout between Texas and Oklahoma played at Texas State Fairgrounds clearly show half the crowd in Sooner colors and half in Longhorn burnt orange. Nothing like this happens in a regular season NFL game. 10. The pageantry and traditions in college football are just better. College football does a much better job of supporting the games on the field with traditions that make the experience of one team unique from another. From the team colors to fight songs to cheer leaders to mascots and marching bands, college programs put a unique stamp on each team that separate them from the schools that they play. Teams play rivalry games on the same weekends dating back in many cases more than 100 years and play for oddball trophies calaimed from the vanquished in an unorchestrated takeover of the opponent’s sideline before the final gun sounds. And it isn’t just the fabled rivalries where these traditions exist–Arizona and Arizona State have been playing for the Territorial Cup since 1899, before Arizona was even a state (hence the name of the trophy). There are so many traditions to talk about that one can only name a few–from Wisconsin’s “Jump Around” at the end of the third quarter to Osceola and Renegade driving a burning spear into the turf at Florida State to Penn State’s legendary nighttime whiteout; you know where you are at as soon as you see these things. 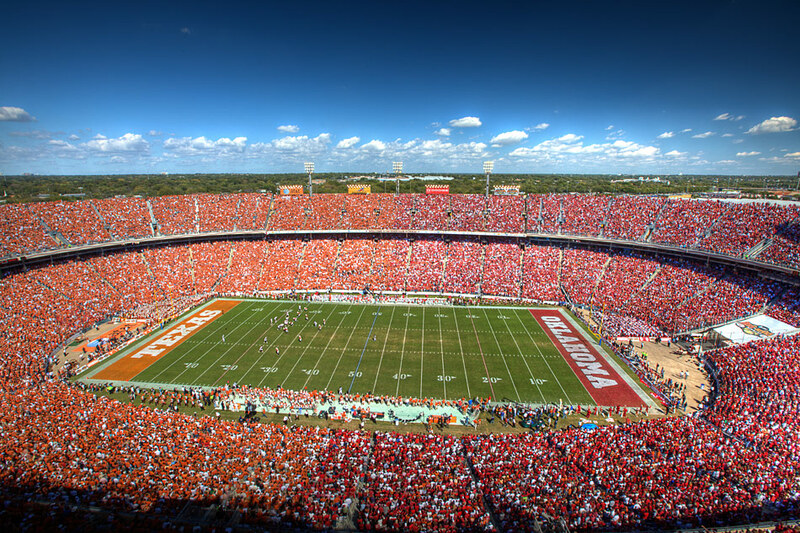 College football also has interesting game venues such as the Red River Rivalry between Texas and Oklahoma played at the Texas State Fair grounds or the world’s largest outdoor cocktail party that preceeds the Florida-Georgia game. By contrast, NFL games are a stale corporate experience that offer few unique experiences (I have news for NFL fans, getting together and drinking Schlitz in the parking lot and grilling brats is not a unique experience). One of my fondest memories of CFB was rushing the field after my alma matter ended a nine game losing streak to its rival, helping to take down the goal posts, and marching with them down the main street that cuts through the heart of campus while singing our school’s fight song (this really happened). Do this in the NFL, and you’ll find yourself with a temporary new residence while you wait for your court date (can’t get close to the millionaires!!). 11. My conference can beat up your conference. I have to admit, this is perhaps the oddest novelty of college football, but as a die-hard fan, I often find myself drawn to it. For years, when only two teams played for a title, so much emphasis was placed on the strength of schedule, that it really mattered how other teams in your conference fared. As such, if you are an Alabama fan, and as much as you might despise them, you might find yourself having a better chance to make the playoffs if Auburn comes into the Iron Bowl undefeated (it is particularly satisfying to beat your rival when they are in a position to play for something of consequence too). This leads to fans pulling for teams in their conference in what can only aptly be described as an awkward allegiance. Whether it is fans down south chanting “SEC-SEC-SEC” in games that involve big conference wins or Midwest fans that have grown up hating the old Pac 10 because of the Rose Bowl, wins by other teams in your conference matter to college football fans. In fact, some stupid bank that won’t be mentioned here tallies wins and losses by conference in bowl games and hands out a trophy for the conference that does the best in the bowl season, and fans definitely notice and yell at each other about it. I can’t remember the last time I heard anyone say “the AFC north did well in the playoffs” or “I’m rooting for the Giants because they are a NFC team,” because no one cares about conference or division affiliation in the NFL outside of whether your team makes the playoffs. 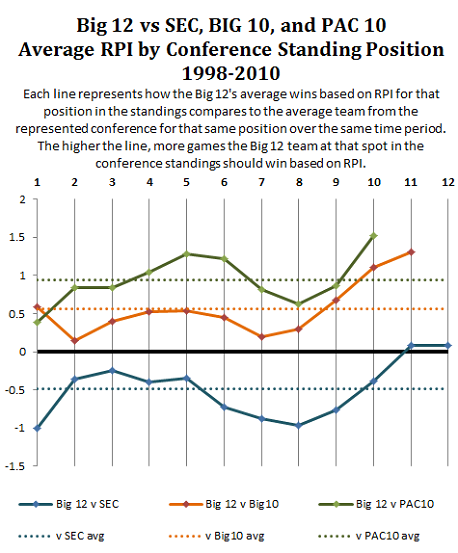 Only in college football do fans really care about graphs such as the one pictured below which charts the relative strength of the various conferences. And again, what this functions to do is make more of the games interesting to die-hard CFB fans. 12. The venues for college football games are far superior to that of NFL venues. In college football, stadiums that in some cases have existed since the 19th century, are unique and iconic shrines that put a stamp on each program (and aren’t torn down every 20 years when some fatcat blakmails the populace for a new building). Think of Death Valley in Clemson South Carolina or the Big House in Ann Arbor, or games played between the hedges in Georgia. Tailgaiting on college campuses at places like the Grove, the Farm, the Vol Navy or the boat slips at Baylor are far superior to loitering in parking lots in what feels like an orchestrated corporate event in the NFL. Many college stadiums dwarf NFL stadiums, seating more than 100,000 plus rabid fans each Saturday, with Michigan’s stadium currently listed as the largest holding 107,601 people–you simply can’t replicate this kind of atmosphere in smaller and increasingly more empty NFL stadiums. 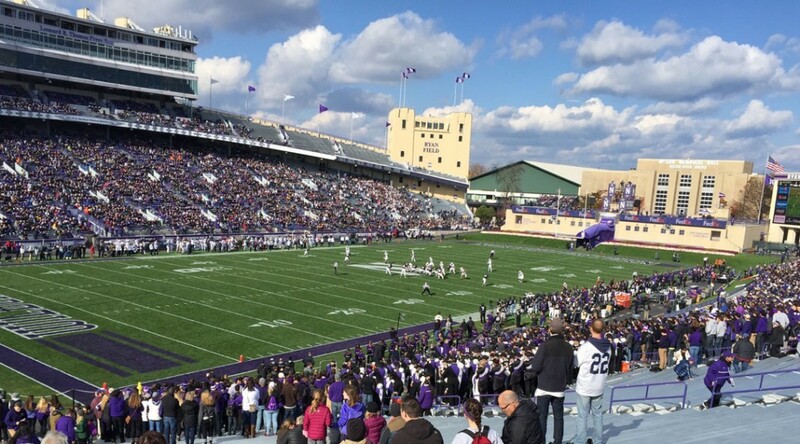 Stadiums in college football are often blended into the campus environment naturally, with academic buildings incorporated into the stadium design such as what you see at Northwestern’s Ryan Stadium pictured below. And while this might only matter to me, I love that college stadiums are called Memorial Stadium or Ohio Stadium and not Comcast Field or University of Phoenix Stadium (perhaps the most absurd stadium name ever for a professional team). In contrast, NFL stadiums are mostly corporate cookie cutter stadiums surrounded by asphalt parking lots named after insurance companies or banks. And I stole this idea from another article, but student sections funk all over corporate luxury boxes. I have had the distinct pleasure to have season tickets and stay in the student section for several seasons, and there is nothing like it. Students stand the whole game, sometimes rocking the stadium with an atmosphere that rivals European soccer matches (and no, student sections aren’t alcohol free, like some would lead you to believe). For this guy, this experience sure beats the corporate button-up Grey Poupon atmosphere that accompanies the NFL luxury box experience. 13. There is nothing better than sticking it your rival in a way that cripples their season. Quick, when people talk about the best rivalries in sports, what matchups are thrown out most often? Ohio-State-Michigan? Alabama-Auburn? Maybe The Red River Rivalry? Sure, Bears and Packer fans probably talk about Bears-Packers, but no one else does. There are two primary reasons for this: 1) nothing intensifies the meaning and value of a rivalrly game when it only happens once every 365 days (sorry, Yankees-Red Sox in baseball isn’t a big deal any more since it happens 19 times a year); and 2) the intensity of the rivalry is directly related to the consequence suffered by the vanquised. So when Ohio-State and Michigan met for The Game that last weekend in Novemver historically, the winner won the Big Ten and played in the Rose Bowl while the loser went home and had to live with it for a year (there is no better feeling for the sport’s fan than an equal measure of euphoria and schadenfreude). But in the NFL, the Bears and Packers play twice a year, and even at that, both teams could still make the playoffs. This is why you can talk to CFB fans about results of The Game that happened decades ago but why NFL fans often can’t tell you who won the Packers-Bears game at Lambeau field two years ago (well, yeah, it was the Packers, because, well, it’s always the Packers). 14. There is more diversity in college football systems which create more compelling matchups. If you look at the history of college football, we have seen diverse systems such as the power I-formation, the air raid, and triple option offenses. And even today, you still see all of these offenses. This makes for more interesting matchups because, it isn’t just which group of players is better, but what system trumps the other in a particular matchup. It is why it was always interesting to watch the power pro-set Stanford Cardinal take on the spread Oregon Ducks. Sure, the spread is all the rage today, but even today’s spread offense has so many different looks that it is simply inaccurate to characterize all such systems by one generic term. And speaking of the spread offense in all of its forms, it might be the single biggest reason why offense has exploded in CFB, the point of the opening paragraph of this piece. The NFL is more of a button down league that uses fewer systems and playbooks, a copy cat league where if one team discovers something that works, it won’t be long before other teams begin doing it too. Growing up watching NFL games after the 49’ers success under Bill Walsh, NFL offensive systems varied all the way from the west coast offense to the west coast offense. Even today in CFB, the service academies still run a triple option which makes for interesting games for teams that never see them, Whether it is stubbornness or the fact that it just would not work, NFL offenses have not embraced the spread offense to the same extent as its college counterparts, one reason why offensive production lags behind at the NFL level. 15. The college post season is the most unique in all of sports, and as far as a overall player and fan experience, is superior to the NFL. As someone who was once a NFL fan first, there is no denying that there is an synergy to NFL playoff games, one you can even feel watching the games on TV. Playoff games in the NFL represent the best that sport has to offer. But this point isn’t just about the game itself, but the overall player and fan experience. Bowl games for the kids often represent out-of-state trips at a time in their lives when they likely wouldn’t be able to afford such a venture, and includes far more players than would be the case if it was limited to a set number of playoff teams. For fans, they are events, vacations from cold rustbelt-weather states to places like Pasadena or sunny Florida. A trip to see the Rose encompasses far more than the game, to include the famous parade that in and of iteslf is a reason that people go to that bowl game. By contrast, NFL playoff games are just one more game in the same venues where regular season games are played, no pageantry, no flare. I hear complaints all the time that there are just too many meaningless bowl games, and objectively speaking, this is probably true. While debating this with another passionate CFB fan, I suggested that only teams with winning records should play in bowl games. But I really missed the point of the bowl game system with this comment, which for most of the games, has nothing to do with determining the sport’s champion. And besides, as my opponent in the debate aptly queried, “would you rather watch some meaningless bowl game named after a distributor of car parts or a rerun of 2 1/2 men?” Check and mate. It was a few years ago, but the powers that be figured out a way to give us a bowl game every day from when they started early in December through the national championship, and while I didn’t watch every quarter of every game, when I wanted to watch a game, it was on. Yes, again, more football is better than less football. 16. College teams are not held hostage by an injured starting quarterback to the same degree as NFL teams because offensive success is predicated more on systems. The other major benefit of running a unique offensive system in college football for long periods at a time is that your offensive success is tied more to the system then it is to the play of the starting quarterback, which is why even recently we saw a team win a championship with essentially their third string quarterback. Nothing is more frustrating in the NFL than watching your team’s championship hopes go down the drain late in a season because your QB has been carted off the field on a stretcher. If Packers fans were being honest here, their championship aspirations effectively ended last year the moment that Aaron Rodgers went down for the season. And don’t think the NFL doesn’t know this, which is why you basically aren’t allowed to touch the quarterback any more, making jokes about putting them in dresses and playing flag football less funny with each new rule passed. Simply put, no one wants to watch games with a stiff slow footed white dude who was marginally successful at Iowa. 17. The College football rule differences on the whole make for a more entertaining game. It is better that a receiver needs to only get one foot in bounds. Why, more offense. Likewise, it is better that the clock stops after each first down. Again, more late game comeback drives equals more offense. Though college football uses a 15 yard penalty for pass interference rather than a spot foul, and this isn’t necessarily better for offense, I am ok with this because I don’t tune into games to watch refs walk off penalties, and because, after years of watching CFB, it is obvious to me refs can’t get PI calls right. Beside, whatever lost penalty yardage is made up for by the number of bigger offensive plays we see in CFB anyway. And no comment on the different rules would be complete without commenting on the overtime rules. In the NFL, it is basically adding another 10 minute quarter that can be truncated depending on how the first possession turns out; if the team that gets the ball first because of the random bounce of a coin scores first, the game is over. This makes absolutely no sense. In CFB, teams start in the red zone, which continues the trend of inducing more scoring in the game which is what fans tune in to see. The biggest complain I hear about college overtime is that it is ridiculous to start with the ball in the red zone, because this isn’t “really football.” But fans like scoring in sports, and this isn’t out of place once one considers that European football settles games with penalty kicks and hockey does one-on-one’s with the goalie. And speaking of settling games, if no team scores in the NFL overtime, the game ends in a tie. Simply put, ending any sporting event in a tie is stupid unless we are talking tee ball for five-year-olds (in which case, the sooner that ends, the better). 18. College football fans don’t have to worry about the moving van pulling up in the middle of the night. Nothing crushed me more growing up than watching a greedy fat cat owner move the Cleveland Browns to Baltimore because the city wouldn’t build the team a second stadium to increase corporate profits (rot in hell Art). For me, this is one of the most offensive things about professional sports–we are sold that teams are a fabric of the community (“root root root for the home team”) as part of the con so we foot the bill for stadiums whose only purpose is to host NFL games for owners who get filthy rich off of this. Despite the fact that there are only 32 NFL teams that already have a market monopoly, this hasn’t stopped teams from literally pulling up the moving van in the middle of the night and taking their team to another venue when deemed more profitable to do so. Just in my lifetime, I have seen the Raiders move twice (and they will be moving again to sin city), the Colts from Baltimore to Indianapolis, the Cardinals from St. Louis to Phoenix, the Chargers from San Diego to Los Angeles, and the Browns move to Baltimore. Quick, what was the last college football team that relocated to another venue? Since college teams are programs of schools actually tied to the community, it doesn’t happen. That means I know where the Buckeyes and Trojans and Crimson Tide will play their games, today, and in twenty years; NFL fan can’t say this. 19. I love that college fantasy football isn’t really a thing because of what it has done to NFL fans. This might be my seminal sports “get off the lawn moment,” but I love that fantasy football isn’t a college football thing (though it technically exists, I don’t know anyone who has ever played it). It isn’t that I hate fantasy football, as I have played it for years and had a ton of fun–it’s that I hate what it has done to the NFL fan. If you listen to the chatter in bars or at the games, it is painfully obvious that large swatches of today’s NFL fan cares more about how their fantasy team does than they care about how their actual team does, and I don’t like it. I don’t want to hear fans get all excited because a running back playing against your team scored a touchdown because you will get 6 points in a fake match-up that, in the grand scheme of things, matters to no one but you (it’s true, when you call your fantasy buddies to brag about how your team did, all you are doing is annoying them). I hear none of this chatter at college football games or bars where I gather to watch the games, and that results in fans being more into the actual game. A novel concept indeed. 20. Every day should be Saturday. This may be a function of someone fortunate enough to have had weekends off most of my life, but getting up and watching football on Saturday is infinitely better than doing the same thing on Sunday, especially if one imbibes a few more adult beverages than one otherwise should. That is because, if I need a day to recover, I always have Sunday to fall back on. But even if that isn’t the case, there is just a different vibe to Saturdays knowing that I dont have to work the next day. Well I am here to tell you that, as a consumer, you have a choice too, and for the reasons listed above, that choice should be to watch your football on Saturdays. Lol “temporary residence while awaiting your court date.” The patent Michael a Richard humor. I couldn’t agree more. While I appreciate professional athletes who are the best at their craft, I ain’t watching football to see that beautiful angle route to Danny amendola for 6 yards on 2nd and 8.